After the wedding Republic Pictures stopped casting Dale and Roy together for awhile, feeling that movie audiences wouldn’t have an interest in a married couple starring opposite one another. Although the studio would later change its mind, for awhile Dale’s main job was being a wife to Roy, and a mother to his three children from his marriage to Arlene: Cheryl, born in 1942; Linda, born in 1943; and Roy Jr., or “Dusty,” born in 1946. Since Roy continued to work long hours Dale often felt alone and frightened in her new life. For years she had felt a pull to reexamine and cultivate her life as a Christian, but her devotion to her career had always won out over God. Now, though, she finally answered God’s call and experienced a spiritual rebirth and a renewed, stronger devotion to God. While Dale’s life still held all the challenges it did before, her newfound peace with God brought her new happiness in her life. She described her new life and love of God as contagious, for not too long afterwards, led only by Dale’s example and without her prompting, Roy experienced a spiritual awakening of his own. He also began a new chapter in his life by devoting his life to God. At age 37, when Dale had been married to Roy for two years, she became pregnant. Previously doctors had told her she would not be able to conceive without surgery, so she and Roy were surprised but thrilled with the news. On August 26, 1950 Dale gave birth to a baby girl she and Roy named Robin Elizabeth. Their joy was quickly tempered with fear, however, when the newborn was diagnosed with Down’s syndrome, a serious condition with numerous life-threatening complications. Though institutions for children like Robin were pretty much filled to capacity at the time, their doctors nonetheless thought that Dale and Roy’s celebrity would allow them to find an opening, and they suggested institutionalizing their baby daughter. The Rogers’ refused. Baby Robin came home to the Rogers’ household, and throughout the pain and joy of the next two years the family came together. The trials of a very ill child did not alienate the family from their newfound faith in God, but instead made it stronger. The resentments the older Rogers children had toward their new mother began to weaken and disappear as they united in love and concern for their littlest and weakest sister. Dale recounted later that it was Robin Elizabeth that furthered and strengthened her and Roy’s belief in, and commitment to, Christianity. After Robin died two days short of her second birthday in 1952 Dale wrote her first book, “Angel Unaware” about the brief life of her and Roy’s daughter. She felt that it was her job to deliver the messages taught to them by God through the help of their little girl. “Angel Unaware” was a short book, and a difficult one to find a publisher for. Once it was accepted by a publisher it was released in the spring on 1953 and quickly became a bestseller. In 1951 Roy Rogers and Dale Evans made the move to television with “The Roy Rogers Show.” The show debuted on December 30, 1951 and aired new episodes until 1957. There were 100 (some sources say 104) episodes of the show, all starring Roy Rogers and his horse Trigger, Dale Evans and her horse Buttermilk, Pat Brady and his Jeep Nellybelle, and Bullet The Wonder Dog. The show aired on Sunday evenings on the NBC network, and featured a Western theme with plenty of good guys, bad guys, and action on horseback. 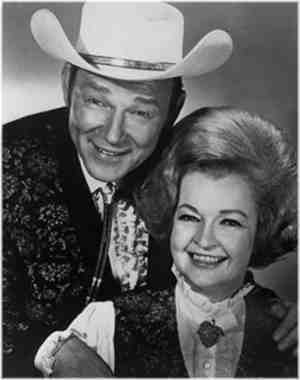 The show was as wildly popular as Roy and Dale’s movies, and each episode was closed with the couple singing their theme song, “Happy Trails,” which was written by Dale. When Dale Evans married Roy Rogers on December 31, 1947 the newlyweds had four children between them. Dale had her son Tom, born in 1927 during her first marriage. At age 20, Tom was already an adult when Dale and Roy were married. Roy had three children with his wife Arlene but they were much younger: Adopted daughter Cheryl Darlene, born in 1942; Linda Lou, born in 1943; and 15 month old Roy Jr., or “Dusty,” born in 1946. The number of children in the Rogers household remained at three until Dale gave birth to Robin Elizabeth in 1950. After Robin’s death in 1952, the couple was devastated but knew that they badly wanted more children. Within two months of Robin’s death Roy and Dale adopted two more children into their home: A baby girl named Mary Doe or “Dodie,” and a five-year old boy named John David, or “Sandy.” Dodie was a healthy baby girl, but Sandy had a long history of extreme abuse and was also suffering the effects of long-term malnutrition. In February of 1954 Dale and Roy added another daughter to their family. They were traveling through Great Britain for personal appearances and to encourage people to see Billy Graham who was soon scheduled to appear in London. While visiting an orphanage in Scotland they met Marion, or “Mimi,” a 13 year-old girl that had lived in the orphanage since the age of two. Since Mimi’s divorced parents were still alive the young girl was virtually impossible to adopt, but Dale and Roy managed to arrange for her to visit them in America. The visit was extended several times, and Mimi eventually became Dale and Roy’s legal ward and a permanent member of their family. The last child added to Roy and Dale’s family was a little girl of mixed Korean and Puerto Rican heritage. A Korean war orphan, she was virtually un-adoptable in Korea because of her mixed heritage. Roy and Dale adopted her in 1955 when she was about three-and-a-half years old. They named her Deborah Lee, or Debbie for short. As the Rogers family matured they had many happy years before they were again touched by tragedy, In 1964 Debbie, at the age of 12, was killed in a church bus accident. In late 1965 heartache hit them again when Sandy, at age 19, died an accidental death while serving in the military in Germany. Dale had already written the bestseller “Angel Unaware” after the death of her and Roy’s daughter Robin, and she added to her successful career as an author by writing a book for Debbie (“Dearest Debbie”) and for Sandy (“Salute To Sandy”). In each case, she donated the proceeds from the books to charity. Throughout the latter part of her life Dale Evans was also a hard working evangelical Christian. She was a highly popular speaker and tireless volunteer for numerous Christian groups, and from 1996 until her death in 2001 she also starred in her own television program on a Christian television network, “A Date With Dale.” Her devotion to God and spreading His word was one of the greatest accomplishments of her life. In 1967 Dale and Roy opened the Roy Rogers-Dale Evans Museum in a renovated bowling alley in Apple Valley, California. They filled the museum with highly personal mementos from both of their personal lives and their careers. The museum was very popular, and in 1976 they moved it to a bigger building in nearby Victorville, California. She and Roy often walked around the museum in the mornings before it opened to the public, enjoying the history of their lives. Dale battled numerous health obstacles in her later years including diabetes (which she was diagnosed with in 1964), a heart attack in 1992, and a stroke in 1996. 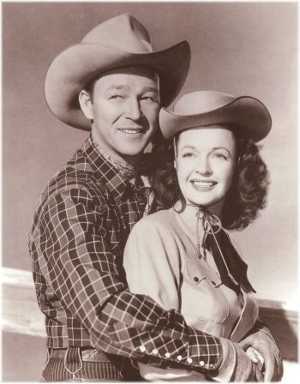 Her beloved husband and partner of more than 50 years, Roy Rogers, passed away on July 6, 1998, at the age of 86. Dale herself passed away on on February 7, 2001 at the age of 88. In 2003 the Roy Rogers-Dale Evans museum was moved from Victorville, California to Branson, Missouri. Dale’s horse Buttermilk was mounted after his death and put on display at the museum, as was Roy’s horse Trigger, and Bullet The Wonder Dog (who starred in “The Roy Rogers Show” and was also a Rogers family pet). The museum, a personal glimpse into the lives of Dale, Roy, and their family, closed for business on December 12, 2009. Name at birth: Frances Octavia Smith. Note: From an early age Dale Evans had used an affidavit provided by her parents as the official information of her date of birth and name at birth. When the affidavit was lost Dale requested a copy of her birth certificate from the Texas Bureau of Vital Statistics. She was surprised to see that her birth certificate gave her birth date as one day earlier than on the affidavit (October 30, 1912 instead of October 31, 1912) and her birth name as Lucille Wood Smith instead of Frances Octavia Smith. Her mother insisted that the birth certificate was incorrect. The information on the affidavit (October 31, 1912 and Frances Octavia Smith) has come to be recognized as her official birth date and name. Thomas Frederick Fox, 1927 – 1929 (divorced). One son. Robert Dale Butts, 1937 – 1945 (some sources say 1946) (divorced). No children. Roy Rogers, 1947 – 1998 (Roy’s death). Eight children including Roy’s three children from a previous marriage. One son, Thomas Fox Jr., born in 1927. Stepmother to Roy’s children Cheryl Darlene (born 1942), Linda Lou (born in 1943) , and Roy Rogers Jr. (“Dusty,” born in 1946). Birth mother of Robin Elizabeth, who was born in 1950. Robin died in 1952 two days short of her second birthday due to complications from Down’s syndrome. Adoptive mother of Mary Little Doe, or “Dodie.” Born in 1952 Dodie was adopted by Dale and Roy while a toddler. Adoptive mother of John David, or “Sandy.” Born in 1946, Sandy was adopted by Roy and Dale in 1952 as a young boy with a history of family abuse. Sandy died in 1965 from accidental death while serving in the U.S. military in Germany. Foster mother of Marion, or “Mimi,” who was from Scotland. While traveling on a tour throughout Europe in early 1954, Dale and Roy met Marion in a Scottish orphanage. She was 13 years old at the time and had lived at the orphanage since the age of two when her parents had been divorced. Both her parents were still alive and British law made a child with living parents virtually un-adoptable. After the Rogers’ returned home they arranged for Mimi to come to America to stay with them for a visit that was extended several times. She eventually became their legal ward and a permanent member of their family. Adoptive mother of Deborah Lee or “Debbie,” a Korean war orphan who was about three-and-a-half years old when adopted by Dale and Roy in 1955. Debbie was part Korean and part Puerto Rican and considered un-adoptable in her homeland due to her mixed heritage. Debbie was killed in 1964 at age 12 in a church bus accident. 1953 – Golden Apple Award for Most Cooperative Actress. 1967 – California Mother of the Year. 1970 – The Texas Press Association’s Texan of the Year. 1976 – Inducted, along with Roy Rogers, into the Hall of Great Western Performers of the National Cowboy and Western Heritage Museum in Oklahoma City, Oklahoma. 1983 – Golden Boot. The Golden Boot Awards honor actors, actresses, and others that have made significant contributions to Western movies and television. 1983 was the first year the awards were given, making Dale one of their first honorees. Among the other honorees that year was her husband, Roy Rogers. 1992 – Inducted into the Western Swing Hall of Fame. 1995 – Inducted into the Cowgirl Hall of Fame. 1995 – Cardinal Terence Cook Humanities Award. 2000 – Inducted into the Texas Country Music Hall Of Fame in Carthage, Texas. The Texas Country Music Hall Of Fame honors singers, songwriters, and others who were born in Texas and that have made outstanding contributions to country music. 2000 – Founder’s Award. The Founder’s Award is given by the Motion Picture and Television Fund Foundation. Two stars (for radio and television) on the Hollywood Walk of Fame. Some sources say Dale has three stars on the Hollywood Walk of Fame, but we were unable to find information on the third star. Before her first screen test Dale’s agent told her to subtract seven years off her age and to introduce her son Tom (that she gave birth to in 1927 at age 15) as her younger brother. She experienced great anguish over the deception about Tom, and was relieved several years later when a Hollywood columnist discovered the truth. Dale Evans wrote many popular and successful songs, including her and Roy’s theme song “Happy Trails.” There is a popular story that Dale wrote the song on the back of an envelope in 1950, less than an hour before she and Roy sang it on the radio for the first time. However, in the autobiography she wrote with Roy, “Happy Trails, Our Life Story,” she writes that she wrote the song while at home one day. Either way, the song became an enduring classic for her and Roy. In the spring of 1953 Dale’s book “Angel Unaware” was released. The book was about the brief life of her and Roy’s daughter, Robin Elizabeth, who was diagnosed with Down’s syndrome at birth and died two days short of her second birthday. At a personal appearance in Madison Square Garden the fall after the book was released Dale and Roy noticed that the seats packed with children held more disabled and handicapped children than they had ever seen at one of their performances before. They were thrilled that the book had encouraged parents to bring their own special children out to the public event, something that wasn’t often done at the time.